Jason hopes to cycle an average of 55km per day, but to account for injuries, rest days, repairs, etc. he aims to do 70km per day. 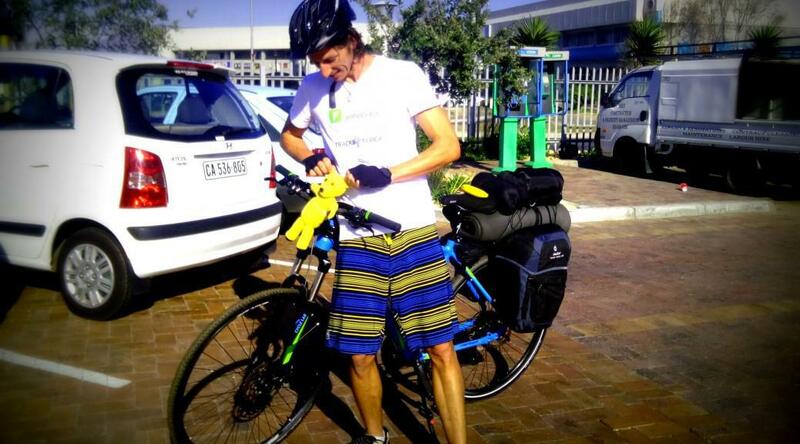 He started off up the West Coast of South Africa, mostly along the N7, and will cross into Namibia at Vioolsdrift. He plans on cycling through south, central and east Namibia before entering Botswana at Buitepos and will plan his route to Zambia from there. This young adventurer grew up in Cape Town and after a few years of sailing around the world, he settled back home and started his own yacht delivery company in 2015. However, his venturesome spirit could not come to rest and he started dreaming about an overland adventure; he contemplated running a great distance or walking across Africa. 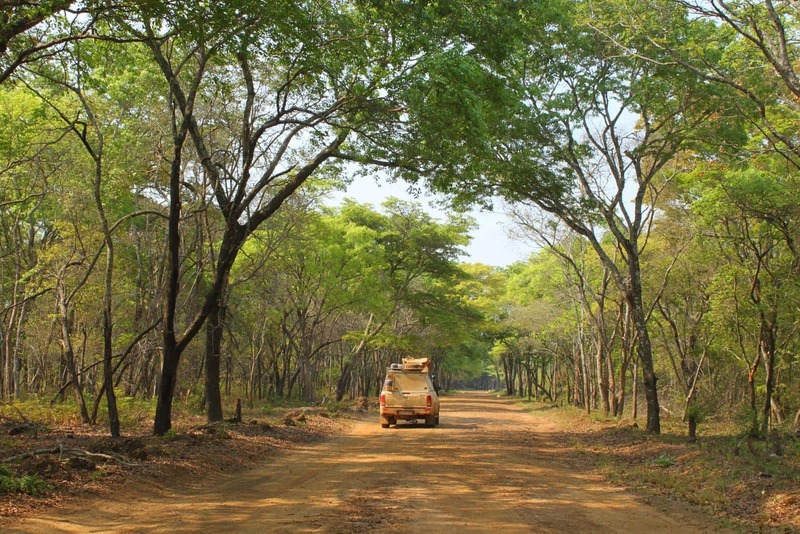 His girlfriend planted the idea of combining an overland adventure with saving trees when she introduced him to Greenpop. She suggested that he should cycle to the Trees for Zambia Festival which is held annually in Livingstone. Greenpop’s mission of encouraging people to live more sustainable and to protect our wildernesses resonated with him and Jason did not let any grass grow under his feet. The idea was conceived in March and in mid-May he was on his way! Greenpop has a Trees for Fees program which enables volunteers to raise money for trees to be planted at the festival. Jason managed to raise R10 000 for trees before he left, which bought him 83 trees to plant during one week’s participation at the Trees for Zambia festival which is held from 7th to 28th July in Livingstone. During the festival volunteers like Jason will plant the trees that have been donated alongside the local community and school children. Volunteers will be accommodated in a large campsite that Greenpop has set up and will also participate in educational programs, horticultural workshops and mural painting at the local schools. 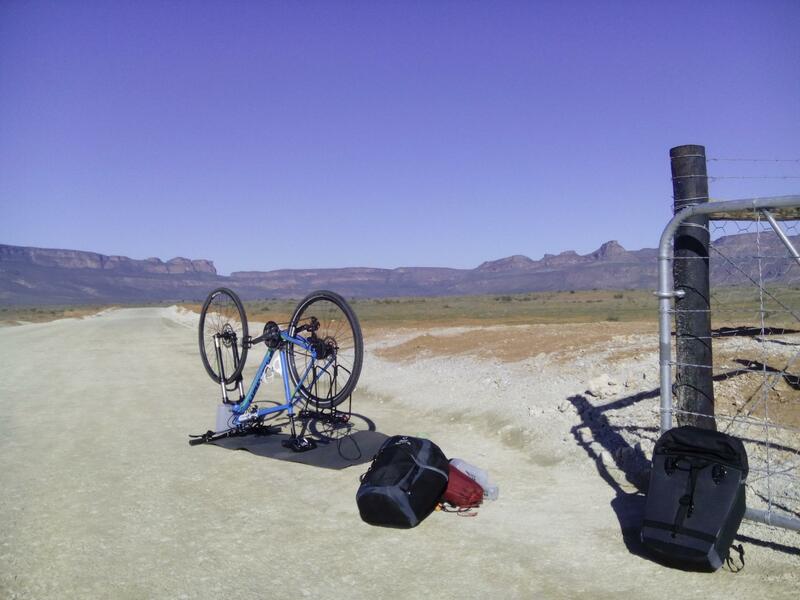 What makes Jason’s journey even more remarkable is that he is completely self-sufficient, with no support vehicle. He carries everything that he needs with him, including his tent which will provide a home for him along the way. Also, he is not an experienced cyclist. He hasn’t owned a bike since his teenage years, therefore he realised that cycling this distance would really challenge him. He normally keeps fit through rock climbing, surfing and running, but this journey would have a different level of extreme, adventure and danger. Right up his alley! 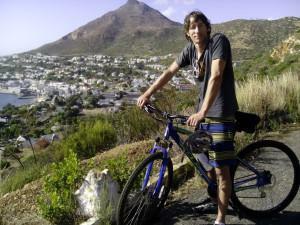 Jason in Cape Town, before he started his cycling adventure. As a yacht Captain, crossing oceans has taught him to be self-sufficient and self-reliant when you are far from civilisation and help. If things went wrong he learnt to draw on experience and ingenuity to correct matters without panicking. As there is no support vehicle, Jason has a satellite phone in case of emergency. One thing is certain, he won’t get lost! He has a GPS with T4A maps, a cell phone with the T4A Guide and the T4A Navigator app and T4A also supplied him with paper maps. You can follow Jason on his 3 000km solo cycling adventure to Zambia by following him on his Facebook page, Cape Town to Zambia for Trees. Thanks to a tracking device, proudly sponsored by Tracks4Africa, you can also follow his progress on the live map on this Return to Earth blog. Yesterday he was almost at the Vioolsdrift border post where he would cross into Namibia. 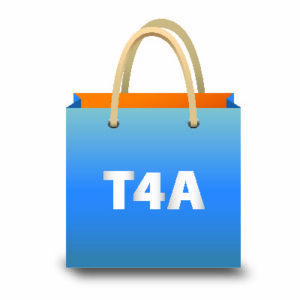 This is a small part of the commitment that Tracks4Africa shows in sponsoring other worthy projects.